Just In Time For Dinner! I hope you all enjoyed that extra hour of sleep this morning courtesy of Daylight savings time. "Fall back" also means winter is right around the corner. 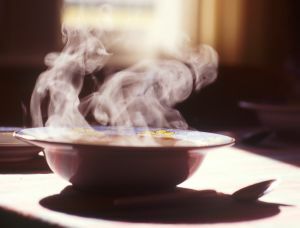 I actually enjoy the cold weather that winter brings, the layers of clothes, boots and fun scarves, but my favorite thing about the season is nice hearty, body warming soups and stews. Soup and stews can be super easy to make and you and can add so many different layers of flavors by just switching up your ingredients. You can buy stock in the carton and jus add veggies and meat or seafood or you can go a step further and make your own stock and build from there. Today, I want to start with the basics and share a simple recipe for homemade chicken stock. I've also listed 3 of my favorite soups and stews to get you started. Add butter to a large pot over medium high heat and add onions, carrots and celery. Cook for 1-2 minutes until onions are translucent, then deglaze with white wine. Let reduce by half. Add water and all other ingredients (be sure to season) and reduce heat to a low simmer. Let simmer uncovered for 4-6 hours. Strain through a fine mesh strainer and cool immediately. Store in the refrigerator for 3-4 days or in the freeze for 3-4 months. Here is today's printable recipe! Hope you enjoy these soups! Make sure you stop by my Foodie Blog for more soup recipes and other foodie fun. Have a great week, See you back here next Monday for more yummy dishes!